ETTU.org - 2019 ITTF World Veterans Tour: Coming Soon To A City Near You! With seven age categories on offer and match formats including Men's and Women's Singles and Doubles events with optional mixed doubles and Team events, this is very much a Tour open to anyone and everyone who continues to show their passion for the sport. 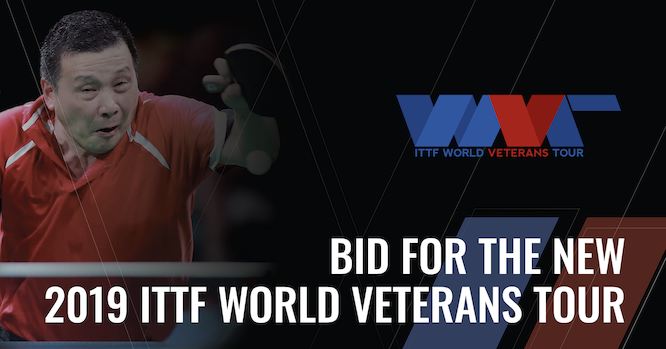 The ITTF World Veterans Tour is not just an opportunity for mass participation in an ever-growing veteran players community, but also for host cities to put on an international sporting event with visibility boosted through the support of the ITTF's Marketing Team. Click here to submit an expression of interest and to find out more about the deadlines of the different bidding stages. "The new launch of the ITTF World Veterans Tour will provide all table tennis lovers with the platform for playing and promoting the culture of the game worldwide." "With our new strategic direction and a vision of 'Table Tennis. For All. For Life' we feel that this is a great fit for the veterans." "Don't worry, this is not going to be a Tour for the professionals like the ITTF Wold Tour. This is designed for everyone. It's about participation. It's about seeing your friends more often."